iCare wants to make use of sensor-based systems to support people with special needs, for example people suffering from dementia, to support them in living as independently and safely as possible, allowing them to remain longer in their familiar environment by creating an intelligent support/assistance system. The existing solutions for a self-determined living in old age, summarized under the term Ambient Assisted Living (AAL) haven’t been integrated into an overall concept that focuses on the needs of people with dementia and there caregivers. The focus of the iCare project lies on already available smart and mobile IT components to assist people with increased need for care, helping them to maintain their independence, by increasing their life quality and reducing costs for health care systems. 15. Dezember 2018: Workshop in Friedrichshafen. Bächle, Michael; Daurer Stephan; Judt, Andreas; Mettler, Tobias (2016) iCare—supporting people with increased need for care with smart and mobile IT. European Journal of Epidemiology, 31 (1 Supplement). S34-S34. 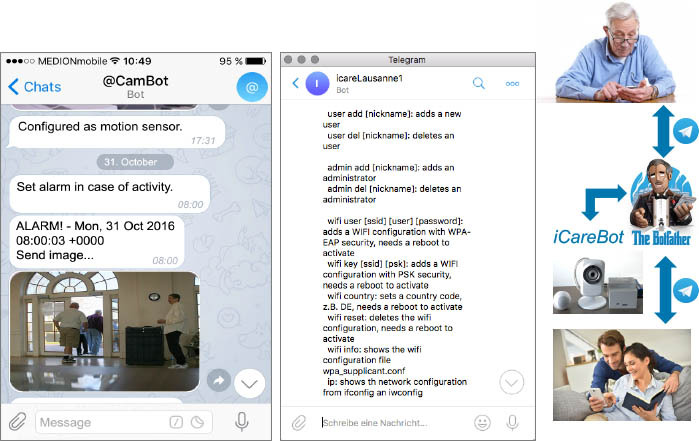 Notfallerkennung mit ambienten Assistenzsystemen als Bots in sozialen Netzwerken. Copyright © 2019 iCare. Powered by WordPress. Theme: Accelerate by ThemeGrill.